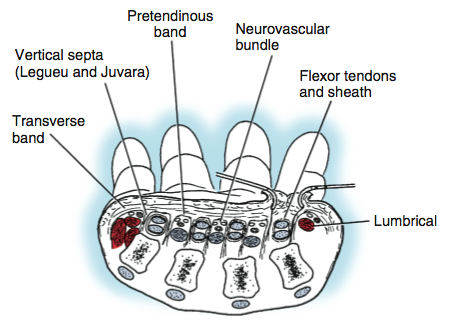 De Quervain's Tenosynovitis Handout | Dr. Thomas Trumble, M.D. De Quervain’s is a painful tendonitis that occurs along the radial (thumb side) of the wrist. People often feel that they have pain when gripping, particularly when the thumb is flexed into the palm (Figure 1). 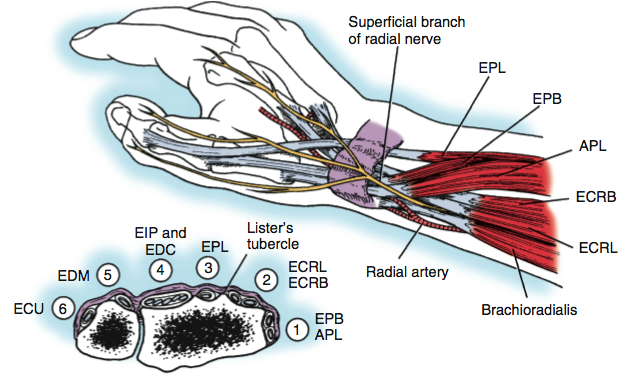 The tendons that control the thumb pass through a very tight tunnel at the level of the wrist. (Figure 2). These tendons control the joints at the base of the thumb. 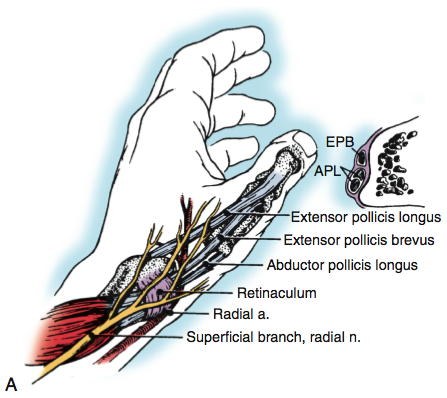 They are called the abductor pollicis longus and the extensor pollicis brevis. Although some patients have only one of each tendon; there are frequently two or more tendons. Often times there is a dividing wall or septum that separates the tendons, which increases the chance of friction occurring within this narrow canal (Figure 3A). The more tendon slips that one has, the higher the chance it is that the condition will occur and that it will not respond to conservative or nonoperative treatment. Who has De Quervain’s Tenosynovitis? De Quervain’s syndrome can occur in individuals of all age groups. It is particularly common in mother shortly after they deliver a baby. It is thought that the act of repetitively lifting the shoulder underneath their arms with the child’s arm between the thumb and index finger is a causative factor. Also, the wrist position during breast feeding can be a causative factor. However, some women develop de Quervain’s tenosynovitis during pregnancy, which is much more difficult to explain and may be related to the hormones released during pregnancy. How do we diagnose De Quervain’s Tenosynovitis? For the most part, this syndrome is diagnosed clinically. 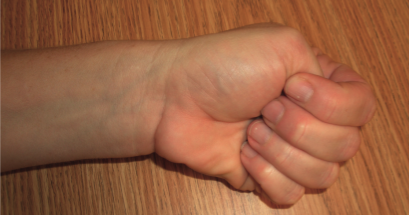 The Finkelstein’s test is performed by having the thumb grasped in the hand and with the wrist flexed and rotated towards the small finger as demonstrated in the figure Figure 1 above. In addition, there could be tenderness when the tunnel where the tendons travel through is tapped or percussed. This is very helpful in differentiating de Quervain’s tenosynovitis from thumb arthritis. In thumb arthritis, the tenderness occurs at the base of thumb whereas in de Quervain’s the tenderness occurs at the level of the wrist. In some individuals, one is difficult to differentiate between the two conditions and ultrasound test can be helpful. How do we treat De Quervain’s Syndrome? 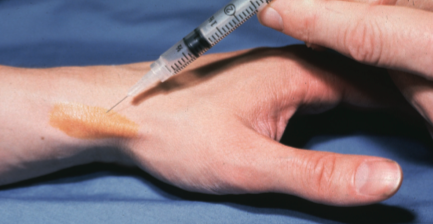 One of the most effective treatments is the use of steroid injections into the tendon sheath. (Figure 4). It is important to use special steroids, steroid medications, or cortisone injections that are soluble and free of any long-acting particles. These long-acting particles can cause atrophy of the tissues and blanching of the skin pigments, leaving areas that appear recessed from the atrophy of the fat cells. A brace is applied that immobilizes the thumb and the wrist. Generally, we recommend only a single course of injection and splinting. If the symptoms do not respond within four to six weeks, it may be necessary to proceed with surgery. The surgery that is involved, releases the tight compartment known as the 1st dorsal compartment to take the pressure off the tendons (Figure 5). This helps to create more space for the tendons. The body ultimately heals the area where the tendon canal or sheath was incised. When it does, it creates a new sheath that is of the correct diameter that avoids irritation and friction. We recommend making the location of the incision along the dorsal margin; the site is close to the back of the hand to prevent any problems with tendon subluxation.